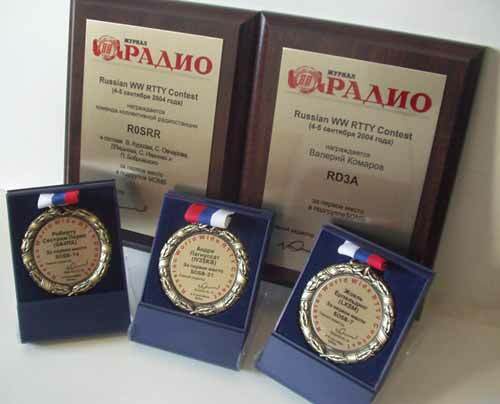 Some 319 participants from 48 DXCC countries submitted logs for this Contest. 74 of them were from 34 Russian «oblasts». MOMB winner is RK0AXX team (RA0ALM, RU0AM, RA0AM, RV0AX, RX0AE). They used R0SRR call-sign in this Contest. UZ4E team (UR7EU, US-E-601, SWL) scored the second and RU6LWZ team (UA6LO, RA6LW, RZ6AUN, RZ6HRO) was the third. SOSB leaders were SP6IHE(3,5 Mhz), LX8M (7 Mhz), 9A4RX (14 Mhz), IV3SKB (21 Mhz) and UX1IL (28 Mhz). Best SWL – YU1RS500. Here are Contest participant’s results (place, call, QSO, QSO points, multiplier and score). Bold call-signs are Contest-award winners, Italic call-sign shows plaque or medal winners. Plaques and medals for contest winners.